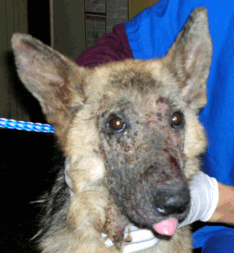 Demodectic mange is a skin disease caused by a microscopic mite which invades hair follicles. Demodex is the most common form of mange in dogs. 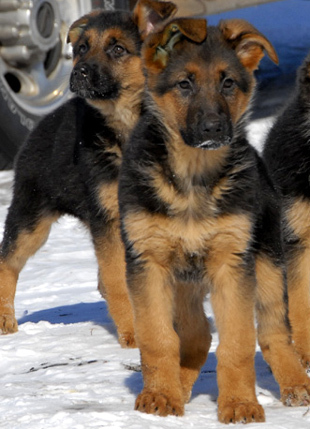 The mite usually multiplies on dogs in small numbers. 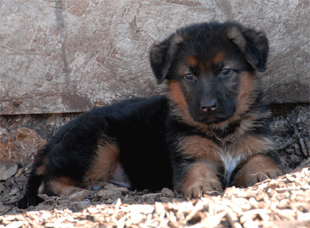 In immune-compromised dogs and puppies, however, the mite can reproduce much more rapidly and cause signs of mange. Demodicosis is not contagious among dogs, although an affected puppy should be kept separate from its littermates who may also be at risk of developing the disease. 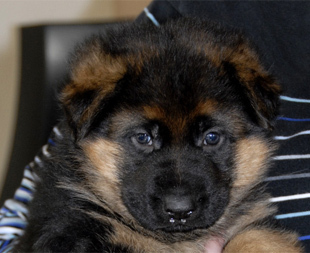 An affected dog usually comes from a litter containing other affected puppies. Because the disease is due to a genetic defect, affected dogs should not be bred and the parents of the affected dog should not be bred again. Demodectic mange, sometimes just called "demodex," is the most common form of mange in dogs. It is caused by the demodectic mange mite, a parasite which lives in the hair follicles of affected dogs. Under the microscope, this mite appears shaped like an alligator with eight legs. All dogs (and many humans) have a few of these mites on their skin. As long as the body's immune system is functioning, these mites cause no harm. 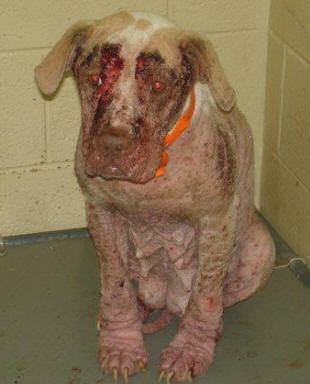 Demodectic mange most often occurs when a dog has an immature immune system, allowing the mites to grow rapidly. This disease occurs primarily in dogs less than 12-18 months of age. In most cases, as a dog matures, the immune system also matures. Adult dogs that have the disease usually have defective immune systems. The primary symptom of demodectic mange is patchy hair loss without itchiness, usually occuring around the eyes or on parts of the face. Two patterns of hair loss exist the localized form that is restricted to a single part of the body (such as the face), and the generalized form, involving several areas of the skin. Demodex mites can be easily identified by your veterinarian by taking a scraping of the skin and examining the scrape under the microscope. Demodex mites have a classic "cigar-shaped" body and move around on the slide. Treatment might include any or all of the following: topical ointment, dip, medicated shampoo, oral antibiotics and other medications, in resistant or recurring cases. The localized form is usually treated with topical medication. The generalized form requires shampoo therapy and a special dip or oral medication. Shampooing with special cleansing shampoos helps flush out the hair follicles prior to dipping. The dip commonly used for demodectic mange contains the insecticide amitraz. It may produce some side-effects for both you and your dog, if it is not used properly. Your dog may experience vomiting and sedation for 24-36 hours following each application. If so, those problems will usually be self-limiting. If this occurs, the dip should be diluted with 25% more water the next time it is used. Since each dipping results in greater tolerance to the dip, your dog is less likely to have side effects with each subsequent treatment. If you do the dipping yourself, be sure to wear rubber gloves to prevent getting it on your hands. Your veterinarian will perform multiple skin scrapings over the course of treatment to ensure eradication of the mites. Because the treatment for mange can be quite intensive, you can arrange with your veterinarian to perform the dips on a regular basis. Since the mite is found on virtually all dogs, exposure of a normal dog to one with demodectic mange is not contagtious.